Tuesday evening at 'That Alpine Group' quilt night, Kim and I were talking about the "blessings" of blogging and how we've "met" so many fabulous women that we would never have the chance to know otherwise. I am constantly impressed by the caliber of talent and character that I associate with via blogging. I'm so grateful for all of you. Thank you for inspiring me on a daily basis and being such a great support system for me. Bonnie from Calmity Jane's Cottage is one of my newer blog friends. If you've never been to Bonnie's blog you need to check her out. 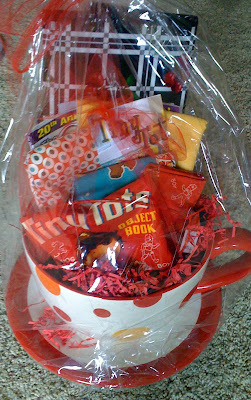 And not just because she sent me a sweet goodie package this week either. 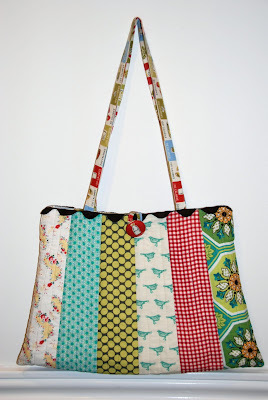 Bonnie's blog is a cross between, sewing, quilting, crafting, vintage treasures and just plain good stuff. Anyway, Bonnie sent me a suprise this week and it was such a pick-me-up and dare I say "warm fuzzy". Wow. I haven't said that catch phrase since the 80's I think. Forgive me. Bonnie sent me the most fabulous waffle cotton fabric so I can make more dishcloths. The blue is a paisley print and it is thick and luscious. The red is . . . well RED! And also thick and lovely. 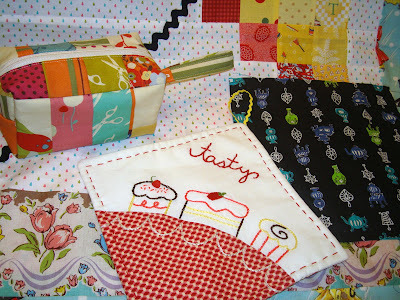 I'm really excited to make more dish cloths. Thank you so much Bonnie. I actually didn't know waffle cloth came in anything other than white! 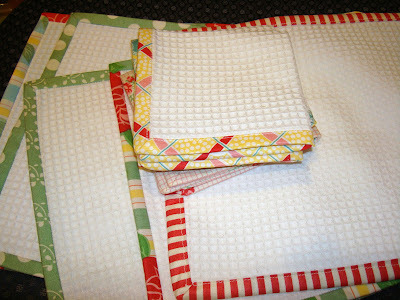 I'm going to wash it this weekend and get to making more of the cute dishcloths. I swiped this picture off Sherri's blog. 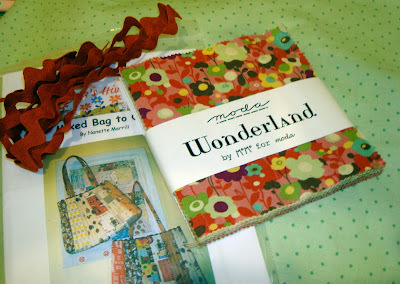 Sherri made the cutest bag using my pattern and Wonderland by Moda. This is just one example how my friends inspire me. So cute Sherri! 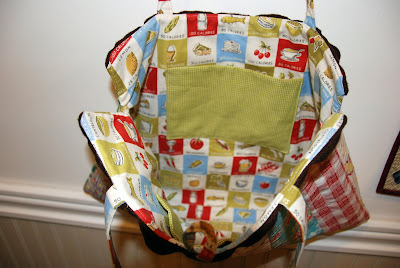 I absolutely love it and can't wait to make my own bag using the Moda charm pack. I'm all ready to go. I just need to make the clock stop for 2 hours. 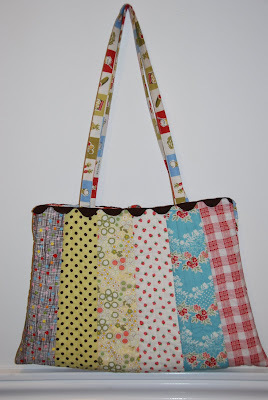 Lori Holt's friend Linda made this bag with my 'Mixed Bag' pattern. It is always so exciting to see something made from my patterns. I love seeing everyones creations. This turned out so cute Linda. Thanks for sending me the pictures, Lori. I love the fabrics colors. Isn't the lining great. I used to have some of that fabric. It is such a cute kitchen print. 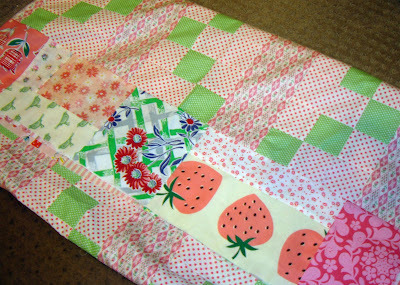 Here is a finished flimsy I am getting machine quilted. 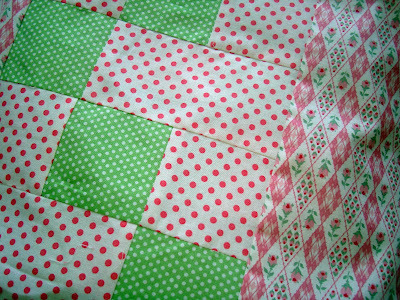 It's a pink and green quilt I started last week and it's from my quilt pattern that was published in Fons and Porter last year. I'll show better pics after it is quilted and bound. It is so hard for me to work with just 3 fabrics in the body of a quilt and so I let myself go a little crazy with the border. We'll see how it quilts up. I'm not quite sure at this point. I confess I sewed most of Saturday. When I have a complete day to sew I like to watch old movies I have DVRed. I don't watch closely mind you. I'm sewing! But I listen and steal glances as I cut out and sew. I can't think of many better ways to spend a Saturday. It was relaxing and I got quite a bit accomplished. Friday night through Saturday night I watched "Funny Girl", the original "Cheaper by the Dozen", "Two for the Road (Audrey Hepburn)", "The Butterfly Effect (disturbing)" and"Erma LaDuce (I really like Shirley MacLaine)". I had pieced this baby strip quilt a couple weeks ago. My daughter Chelsey needed a baby gift for a friend and the friend hates pink. 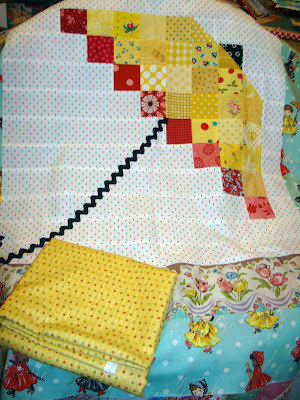 So I went to my 14" x 4" strip pile and picked out some more earthy tones along with yellow to make the quilt. It went quite fast. I cut my strips up into different lengths and then chain pieced the strips. I cut the sewn strips to 32" and then just sewed them together side by side. I used this yellow dot to make the scrappy feel more cohesive. After seeing and getting some of Monica's lovely buttery yellow dot fabric, I found more on sale at the Quilting Cottage in American Fork. Sorry - they only had 1 1/2 yards left and I bought it all. It wasn't exactly like Monica's fabric but it was close enough. Saturday I had time to machine quilt this. I tried out my new superior thread. I should have gotten a machine quilting thread when I was down in St. George so I used Master Piece thread and the titanium needle. It went really well. I think the machine quilting thread is a bit thicker quality and would have been a better choice but this worked out. The stitching looks really good and my machine tension liked this thread. Sunday I spent time with the family and hand stitched the back of the binding. I'm finished and Chelsey picked it up last night. I also machine quilted my sister's umbrella banner Saturday but I'm not done stitching the binding and sleeve on yet. I cut out and started a new quilt for a "challenge quilt" to show at my Alpine Quilt Group tomorrow. It won't be finished but I'll be partly done. 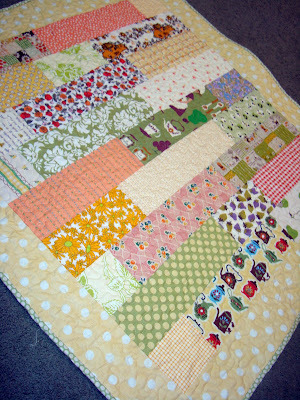 I haven't really used only pinks and greens in a quilt in probably 8 years. The fabrics are really fun in this quilt but I can't say this is my favorite color combination. I used to love pink and green in the 90s. I finished my quilt patterned after the Japanese Cotton Time quilt I started several weeks ago. I had been in a quandary about what to border it in - if at all. 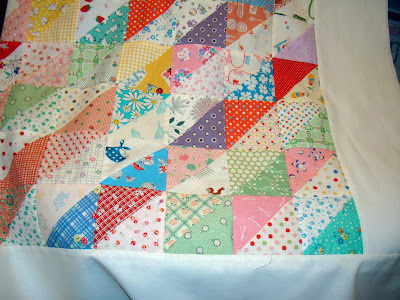 I thought about it at least a week by putting different fabrics next to the quilt body. I ended up with white. You really can't go wrong with white when there are this many fabrics and colors all sewn together. This one is at the machine quilter right now. Some of you asked about this fabric that I made buttons with last week. It is a Michael Miller fabric called "Lava Bloom". Boy is that picture blurry! Sorry. To finish up with my St. George trip I thought I'd show some fabric I picked up down there last week. I showed you the super teacup filled with my quilt kit. I can think of fun things to display in this teacup. This is a picture of the quilt the kit makes. 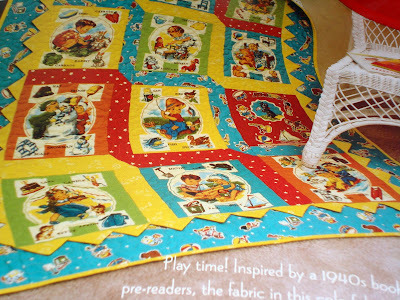 Vintage story book pages by Red Rooster fabric. So cute. 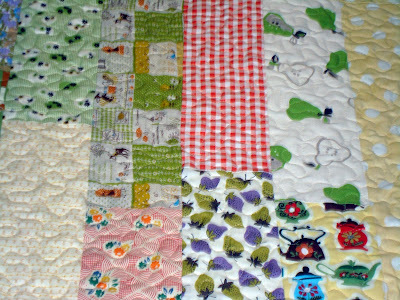 I am not big on prairie points and I'm not really going to make my quilt exactly like this but I love the images of the kids. 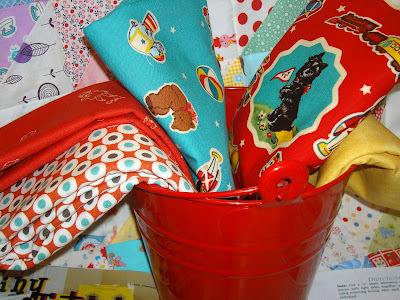 Here is the fabric from the kit and it was in this little red pail. Heaven only knows when I'll find time to make it but I'm sure it will go fast. 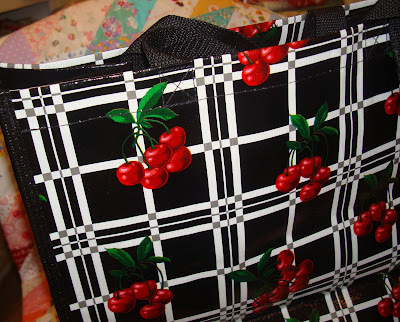 Lynette put in an oilcloth bag from her store into the kit as a little gift to me. Thanks Lynette. I love bags. Don't you? 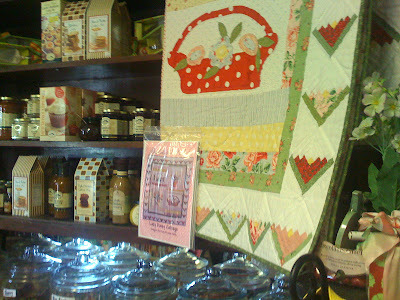 If you go to southern Utah, visit Lynette at her Main St. Quilt Cottage in Hurricane. Tell her hi for me. Oh and I know why they call it Hurricane. It is always windy there. But most of the time a breeze is welcome in the hot weather. 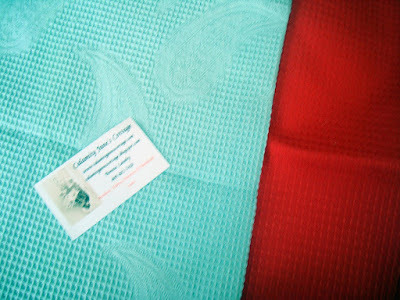 I bought these fabrics at Lynette's shop. 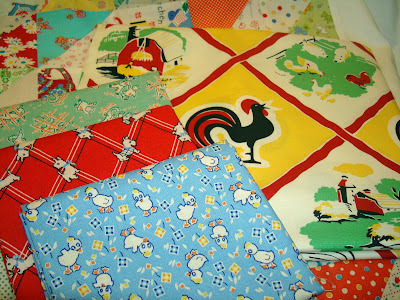 Three reproduction fat quarters and this Red Rooster fabric I've been spying. I also bought 4 fat quarters at Quilt Works. These will work in nicely in my Alpine Group Sampler Quilt we are working on all year. Turquoise and red are my theme colors. 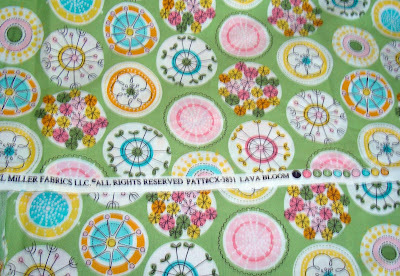 Nedra and I both bought a yard of this circle fabric at Quilt Works. Nedra gave me a coupon for it too. So I got 30% off. You can't beat that. As soon as I saw this fabric I thought it would make great covered buttons. I include covered buttons in one of my patterns/kits. 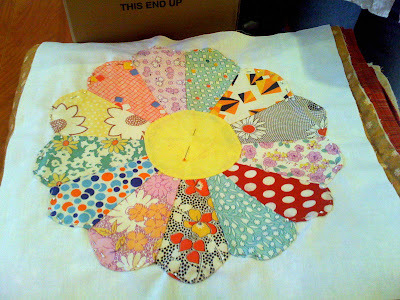 I cut around the circle with a little to spare and then lined the button with a little square of white fabric. This way you can't see the shiny metal through the fabric. Covered buttons are really easy to make. I've gotten them in bulk from several sources. You can get them here. I have jars of buttons on my sewing room shelves. Some ready to cover and some all covered ready to use. I can remember my mom making covered buttons to use in projects like suits and jackets. In the 60s they were quite popular. But they really never go out of style. I like how these buttons turned out. I'm super proud my dish cloth tutorial made it to Whip Up and One Pretty Thing. If you don't follow these blogs already, add them to your google reader. They are filled with fun projects and ideas. Have a great weekend. Weather is heating up everywhere. Yayy Sunshine! 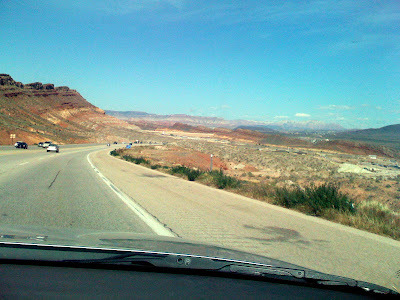 Last Thursday Mr. Hive, my son Mason, and I went on a little trip to the St. George, Utah area to visit my sisters, family and some friends. It snowed most of the drive down and then was in the 80s when we left Sunday. When we got to my sister's home in Toquerville I discovered that I left the battery to our camera at home in the charger!!! So I was left to use my camera phone and my pictures are sparse and generally not great. You can't see the majesty of the southern Utah vista well through a car window anyway but trust me. This was a magnificent site. My sisters, niece and I did a little shopping Friday. 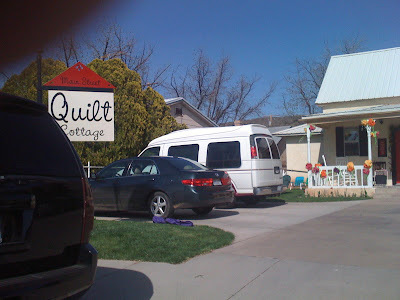 We went to see Lynette at the Main St. Hurricane Utah Quilt Cottage. Every picture I took in Lynette's shop was terrible and I'm sad to say none of them turned out. 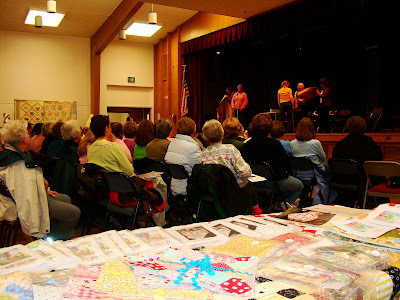 It was Lynette's mother, quilt teacher and designer Blanche Young's, 90th birthday party. 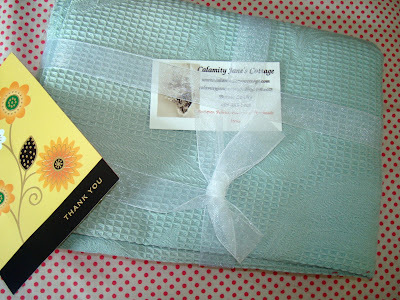 I had ordered this quilt kit from Lynette when I was in Bryce in February. The big giant teacup in orange, yellow and red dots was screaming my name. Everyday at Bryce I eyed this kit. I'm so glad that I had Lynette make one for me. I'll show more of what is inside tomorrow when I talk fabric. Friday we met the fabulous Nedra to give us a tour of Superior Threads in St. George. Left to right are my sister Paula, my sister Michelle and Nedra. I couldn't believe how large the Superior Threads building is and they are doubling it in size! Great things are happening there. 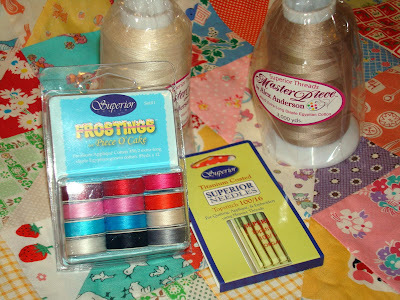 I had been saving for and postponing thread purchases knowing I was headed south to Superior Threads. I was able to buy thread at the warehouse along with the new titanium needles to try out. I haven't used the Alex Anderson Masterpiece thread yet but I'm excited to sew with it. I've been wanting one of these fabulous lights since I saw them introduced on the market. Several years ago I had a detached retina and since then I my need for good light has greatly increased. 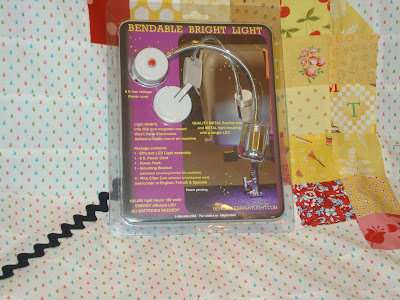 This light is a pricey tool and my sweet sister Michelle bought it for me at Superior Threads. Thank you Michelle. This is something I can move from machine to easy chair (when appliqueing). I'm extremely excited about it. Michelle had made a umbrella banner from my pattern and kit. She brought it along when we shopped to get find matching fabric for the back. I brought it home to machine quilt for her. I can't wait to get it done. She did a fabulous job piecing it. It turned out so beautifully. Saturday I spent time with (l to r) Dawn, Nedra and Sherri. We are old friends now and we had a wonderful time together. It was so fun to spend the day doing what we love - talking about and looking at quilts and fabric. 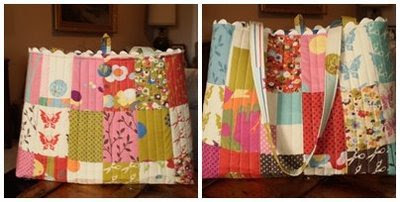 Sherri made us these darling zipper bags (don't you love that Momo fabric! - I'm going to use the bag as a camera case) and Nedra embroidered and sewed the most darling hot pad. 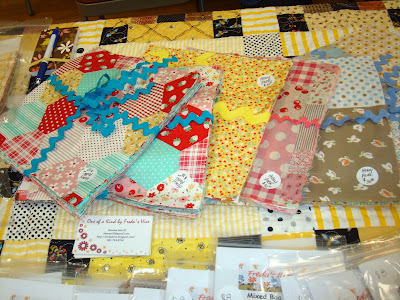 She also gave us a charm square of vintage fabric (so ME!). You've got to enlarge this picture to get a good look at the cute prizes! Thanks again girls. We had a fabulous lunch at Nedra's. 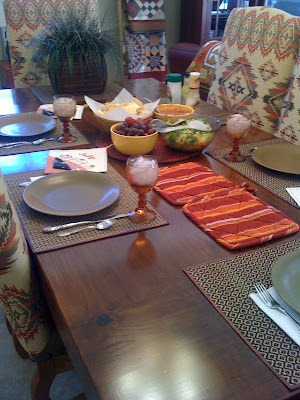 Everything was delicious and the table was all set. I think Sherri, Dawn and I felt like queens! So much better than meeting in a restaurant. We had a tour of her lovely southwest style home. 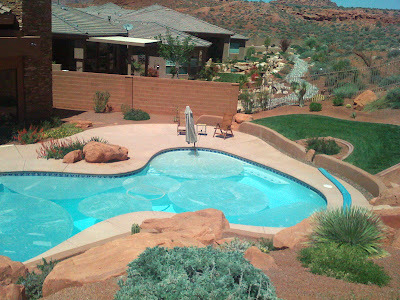 Nedra's home backs up to beautiful red rock and no one can build behind her. Loved it. We got an up close and personal look at Nedra's artistic quilts. She's amazing. They are all fantastic. We brought some show-n-tell. This is Sherri's vintage Dresden plate block from her grandmother. I wanted to divert her attention and pocket these blocks. But of course I just petted and sighed over them. Afterward we did a little quilt store hopping together. It was fun to peruse the shops and compare notes on what we liked. There was so much to like! 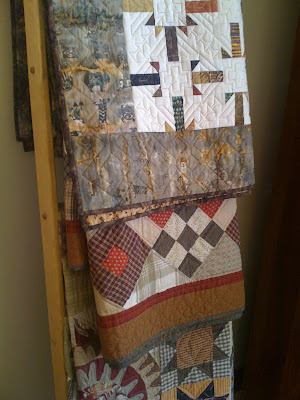 This particular quilt caught my eye at Lazy Daisy Cottage. 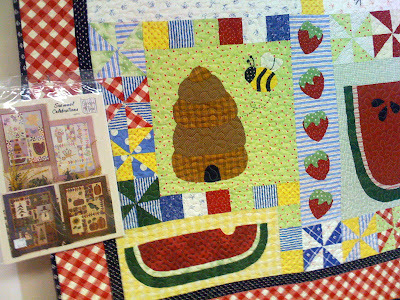 And this very sweet picnic quilt with beehive and bee caught my eye, too. Of course. At Quilted Works this was my favorite quilt. It was made by a friend of Nedra's. Enlarge the picture. 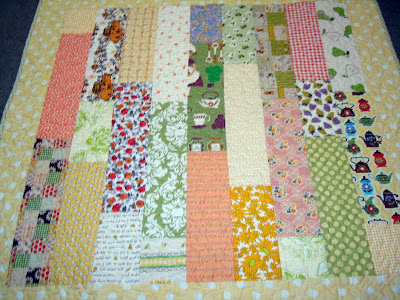 It is a 3D quilt with chenille poking out in each block. It is very original and unique and the western style is fun. Well I'm home how. It was a really great mini vacation and being with my family and friends was totally the best part. 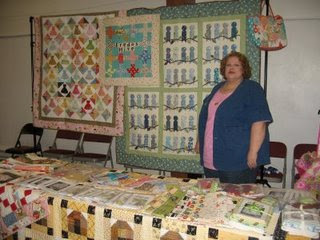 Last week before dashing out of town to southern Utah for a mini vacation, I participated in an event sponsored by Utah Valley Quilt Guild. 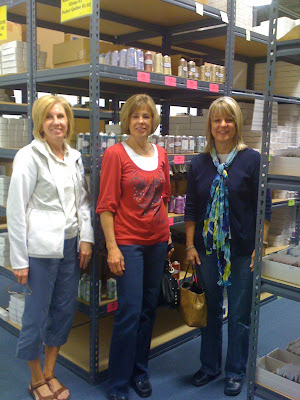 They invited local women in our area to come and briefly talk about our businesses and showcase our patterns/products. Despite a huge spring snowstorm (go figure 14" in my town) the event was fun and successful. 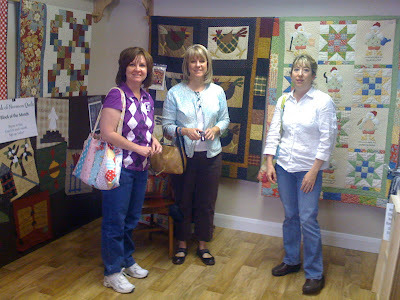 I got to meet local quilters and see some of my friends. Karen and Tricia made a special effort to be there to support me. Thanks girls! And I reconnected with an old friend, Anna Rae. This picture was taken during the meeting portion of the event after I set up my booth. 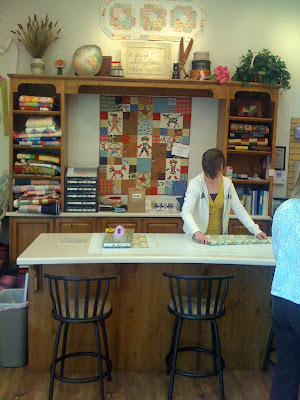 They have a fabulous group of extremely talented quilters. Here we are being introduced and getting a chance to talk a little about what we do. I was in great company. 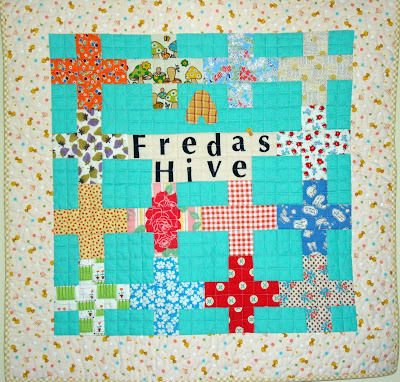 I finished my Freda's Hive quilted sign in the nick of time, the night before the local market event. Whew. I quilted it geometrically and used vintage and reproduction fabric. 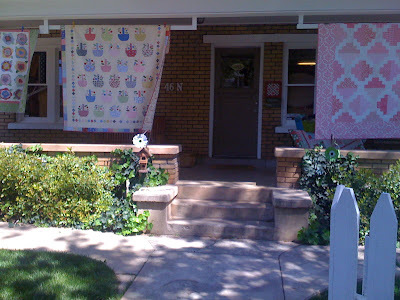 How about that fabric in the corner - vintage novelty cafe curtain fabric and flower pots. Pretty cute, huh. Here is a picture of my booth after it was all set up. 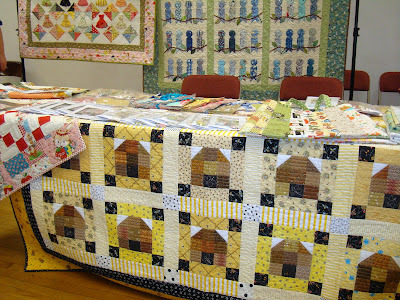 I used my Freda's Hive beehive quilt to cover the table. I'm still in the process of writing up this pattern. 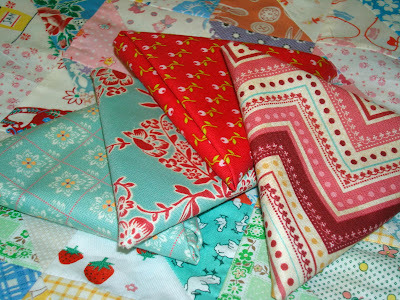 I've been cutting 9 1/2" squares of my vintage and Japanese fabrics. I call them "Honey Packs". I'll be putting some into my Etsy shop this week, too. The historian of the UVQG took pictures for their blog post recording the day's events. Thanks Kim. I swiped this pic from their blog. My daughter Laurie (not pictured) was on hand to help me that day. My pal Paula and her daughter Claire had the booth next to mine. Paula put in a good word for me to be included in the list of local artists. 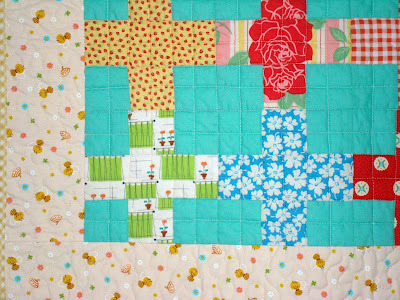 (Thanks Paula) Paula is such a precise quilter. I could learn a lot from her if I just could stand to cut my pieces that small. And she's lots of fun. I got to meet Mary, finally. 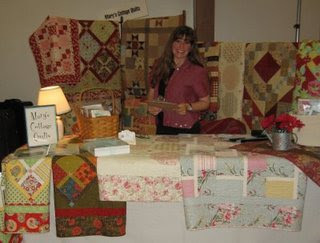 Many of you know her as a fabulous quilter and pattern designer. 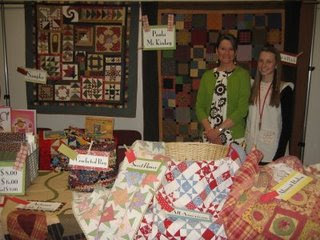 She's so nice and her quilts are just amazing. It was really great to be included in this circle of talented women.